23 years off-grid for water in Sydney’s Sustainable House - so what? Since 1996 a terrace house in the centre of Sydney, NSW, has used rainwater and recycled sewage and has been disconnected from town water and sewer. In case you’re wondering, the four and five person households have had no greater workload than people living on town water. Enjoying $nil water bills they’ve been able to use the rain that falls freely on the roof and keep over 2 million litres of rainwater and recycled water on site. There are no fixed charges as the town systems are not used, just as there are no fixed charges if town gas or town electricity is not used. Using typical tank and recycling systems life has been the same as for their neighbours. Jillian Meehan, an intern working at Michael Mobbs Sustainable Projects, has reviewed data on water use at Sydney’s Sustainable House in the 23 years from 1996 to 2019 and here is Jillian’s analysis. Jillian’s other blogs on off-grid energy data also provide useful analysis on energy use at the house. (The words “off-grid” and “sustainable” are used to mean the same thing here. Mains or town water represents a water supply provided by public utilities or commercial organisations. “While the use of rainwater tanks in urban areas has previously been debated, it is now strongly encouraged by all levels of government and supported by some with offers of rebate. The Australian Government offers a significant rebate on the installation of a rainwater tank under the long term Water for the Future Plan and the associated National Rainwater and Greywater Initiative. Other rebates are provided from time to time in various states/territories and regions. The use of rainwater tanks has become a major strategy to enhance water conservation, reduce the burden of water restrictions and address the increasingly dramatic impacts of drought and climate change. Rainwater tanks now provide for a multitude of uses, including: • drinking water • garden watering • toilet flushing • laundry usage • replenishing domestic pools or spas • car washing • supplying the hot water system • thermal buffers to insulate houses • ventilation for buildings • protecting homes from bushfires. Each person living in Sydney’s Sustainable House uses around 91% less water per day than someone living in a typical 4-person Sydney household. In total, the sustainable house uses 77% less water overall than the non-sustainable household. 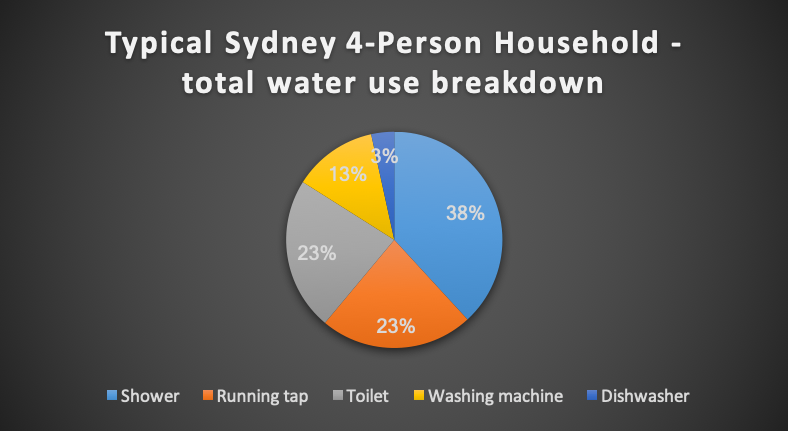 In a typical 4-person Sydney household, the daily water use is about 324 litres per person. In comparison, a single resident of Sydney’s Sustainable House uses only 57 litres of water per person per day. That’s 296 litres of water saved everyday by each person living in the sustainable house. The typical 4-person Sydney household uses roughly 1,296 litres of water per day while Sydney’s Sustainable House’s total daily water use comes to 295 litres. To compare, the sustainable house uses just over 1,000 litres of water less per day than the average Sydney 4-person household. • How is town water (rainwater sold as mains water) used in a typical household? How is this rain water used? In typical houses and sustainable houses, water use goes to a variety of things, like showering or flushing the toilet. The difference is that a Sustainable house’s water is exclusively rainwater and recycled water—no water is taken from the town main water pipes. • How is rainwater and recycled water used in a sustainable house? A non-sustainable house’s water is pulled from the area’s main water pipes. It is all drinking quality water. This is unnecessary. It continues so that the water business may continue as a business that sells water that falls as rain outside the city – it is then piped to those who choose to pay for water that otherwise would fall on their roofs for free. Even if drinking rainwater seems unhealthy (it isn’t - over 2 million Australians drink rainwater every day and no one had died from it; 47% of Adelaide folk drink rainwater, for example), why use drinking quality water to flush toilets, wash clothes, or water a garden? These non-drinking uses are supplied by recycled sewage water at Sydney’s Sustainable House. Sydney’s Sustainable House produces no carbon emissions from its water use. Town water produces roughly 218.07 kilograms of carbon dioxide per person on a yearly basis – that’s 1.1 million tonnes of pollution per year. The air pollution is caused by the high amount of electricity used to pump the water and sewage. Since 70% of Sydney’s water is used in the home, reducing your home’s consumption of water can make a significant impact toward saving water and reducing pollution. A good way to start learning more about your water consumption is to check out your home’s water meter—every Sydney residence has one! To learn more, click here. For a more in depth breakdown of the factors contributing to water use in non-Sustainable homes, click here. What are the cost differences for sustainable versus typical, non-sustainable homes? At Sydney’s Sustainable House, the annual cost is $0. The sky sends no invoices for its generous rain which is dropped on our roofs for free by the clean energy system that rain-making Earth offers us all. However, it does cost something to get to that annual rate of $nil. A 15,000 litre above-ground galvanized iron tank, Aquaplate, pumps, etc. would cost around $5,300. For dealing with wastewater – a 9-person capacity round tank would cost about $7,000. As stated Michael’s Sustainable House book, in total, the start-up cost for a sustainable house would be around $25,000 (p. 243). The bills and their components for houses and units for their water and sewage services are shown in this graph below. • Two prices are charged for Sydney’s town water - fixed charges, and usage charges; this graph shows the break up. With an expected global shortage of water in sight for the near future, it is necessary to take significant steps toward sustainable water use by, for example, supporting sustainable technology like Hydropanel installations anywhere you can. Zero Mass Water’s Hydropanels work with what nature already provides – sunlight and air – to produce safe, high-quality water. Fatballs and fatbergs show up in oceans and other waterways when various materials and substances like oils, fats, chemicals, wet wipes and more from people’s homes combine in drain pipes and wash out to sea or rivers. The result is masses of solid waste that pollutes our rivers and oceans. On that note - may the raindrops be with you.